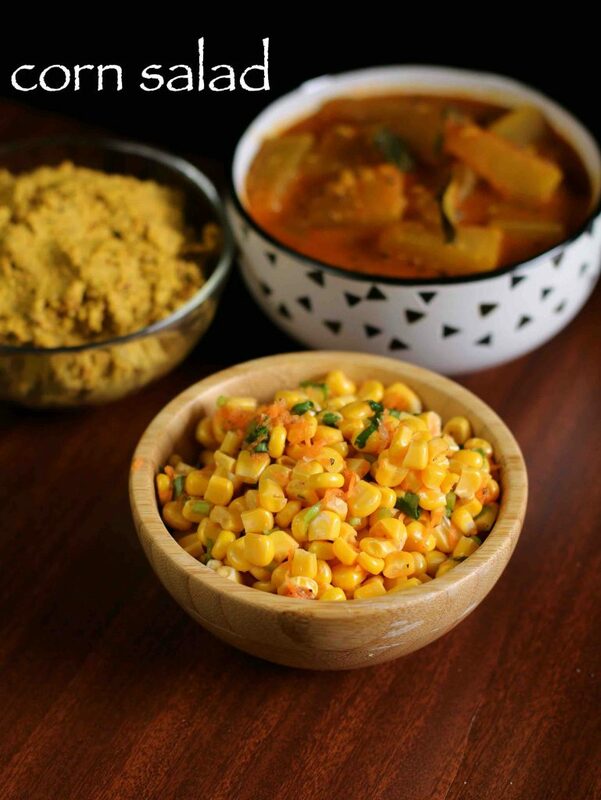 corn salad recipe | sweet corn salad | corn kosambari recipe with detailed photo and video recipe. 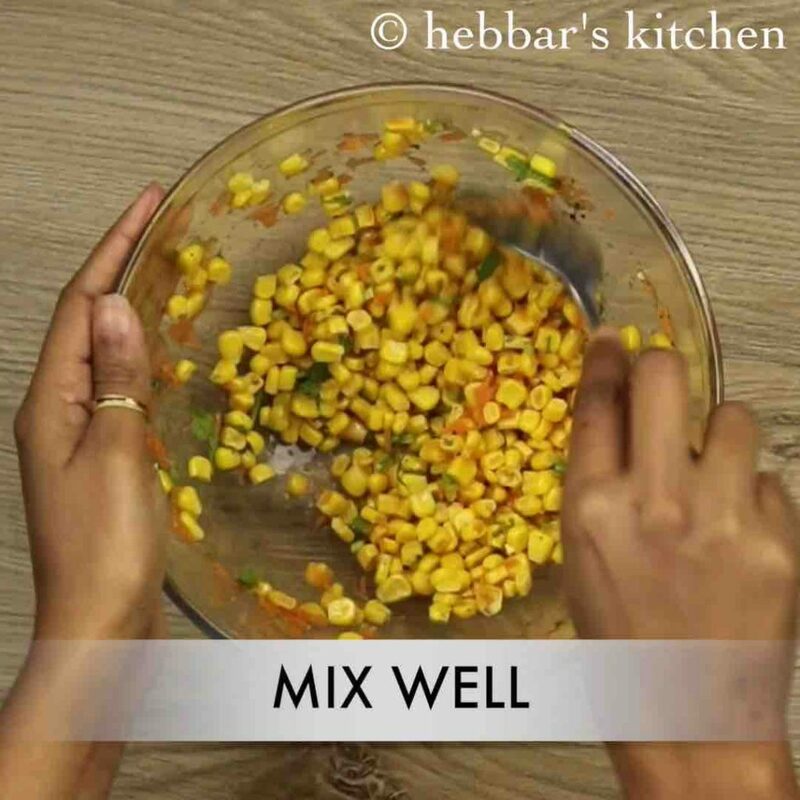 a healthy, simple and tasty salad recipe prepared from fresh sweet corn kernels and mixing it up with other veggies and spices. it is often served as a side dish in meal or thali and is consumed before rasam / sambar with rice. corn salad recipe | sweet corn salad | corn kosambari recipe with step by step photo and video recipe. kosambari is a favourite south indian salad which is typically prepared with carrots, cucumber, lentil and even pomegranate. 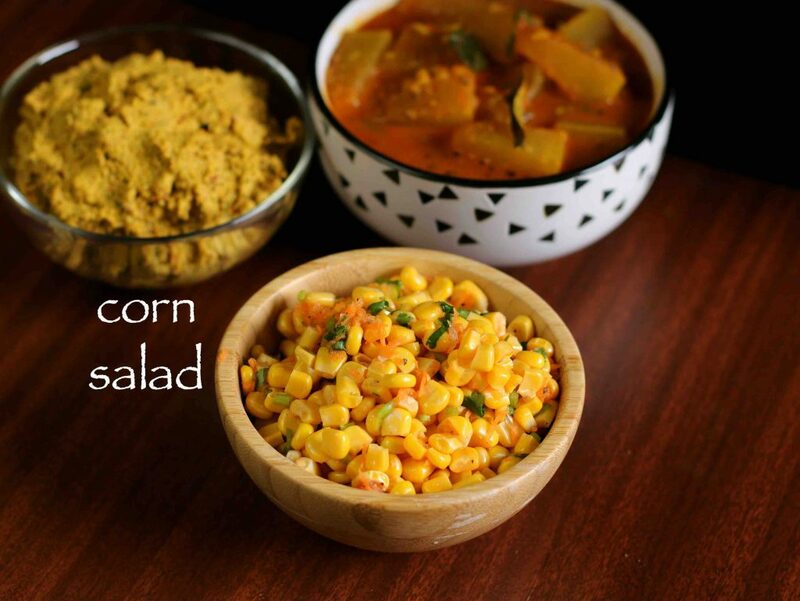 sweet corn salad is new entry into this list and is often prepared by mixing it other veggies or by itself. ideally it is consumed just before consuming the rice and dal combination, but not restricted to eat corn salad as a plain salad. to be honest i have not posted much salad recipes till now in my blog and i was getting several request to post some healthy salad. corn salad is my favourite salad recipe and i prepare this frequently with several variations. 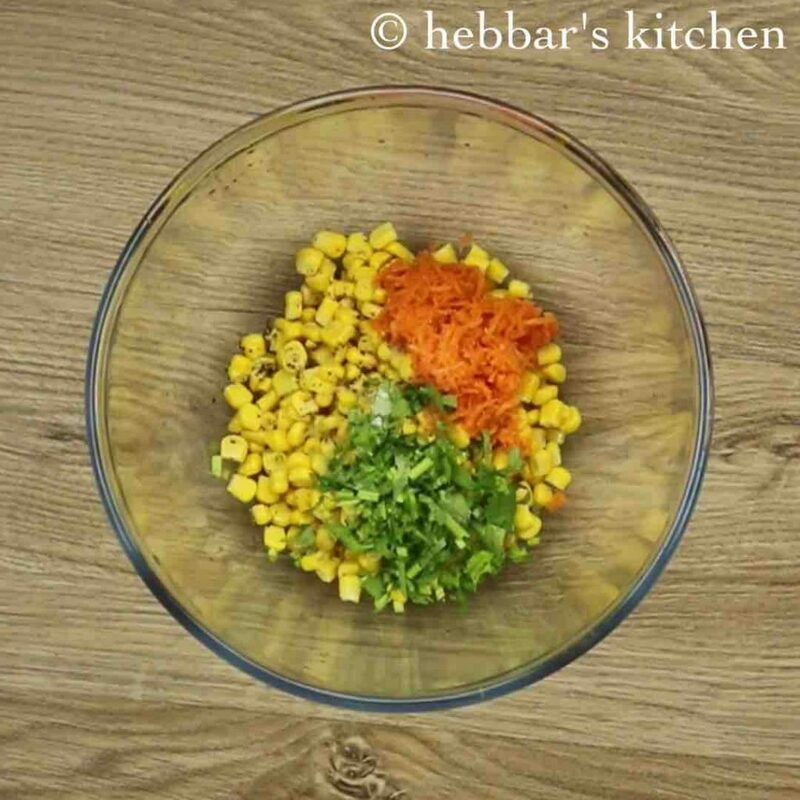 in this recipe post i have prepared plain sweet corn salad without mixing it with other veggies. but it tastes great by adding grated carrots, pomegranate and even soaked moong dal. in addition, it tastes great by adding the mustard and jeera seeds seasoning on top of it. but certainly it isn’t a must and can be skipped safely. furthermore, some important tips and suggestions and variations for sweet corn salad recipe. firstly, i have fresh sweet corn kernels by boiling corn cob first. alternatively, you can use frozen corn and skip the boiling step. secondly, if you planning to consume it as just salad and not as side dish to rice, than add fresh avocados to make it more healthier. further, add some finely chopped tomatoes, lettuce and cooked kidney beans to make mexican corn salad or mexican corn salsa recipe. 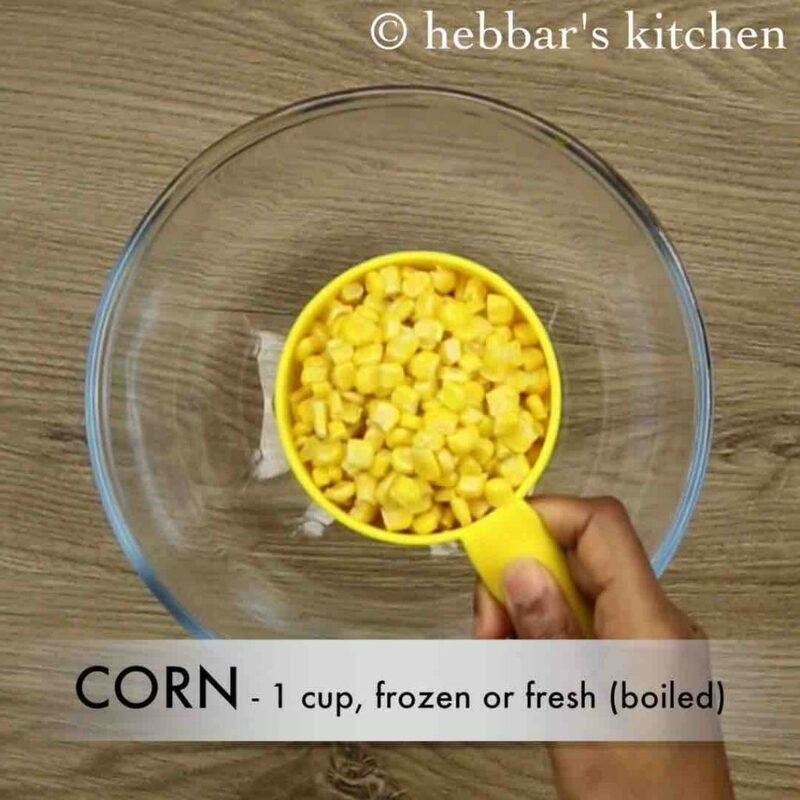 firstly, in a large mixing bowl take 1 cup fresh / frozen corn. boil the corn for a minute or 2 if they are hard. further add 1 tbsp grated carrot, ½ tsp crushed pepper, 2 tbsp coriander leaves, salt to taste and 1 tsp lemon juice. finally, serve healthy corn salad for the lunch. firstly, if using frozen corn, then no need to boil, as they are soft. furthermore, use sweet corn for more more rich taste. also add fresh grated coconut for more flavours. finally, store the leftover corn salad in refrigerator and serve the next day. hi. what if the corns are boiled?